Sight Words BINGO is great fun! Beginners and experts alike have an equal chance for BINGO, and everyone learns more about sight words recognition with every round! Play SIX versions! Pick a different variation each time you play! Choose a caller. The callers says which BINGO version will be played. Example: "This game will be Top Row BINGO". The caller spreads the Calling Mat out, then shuffles the Calling Cards and stacks them face-down by the Calling Mat. Pass out one Playing Card and Chips to each player. Use a chip to cover the square on your Playing Card that matches the word called. 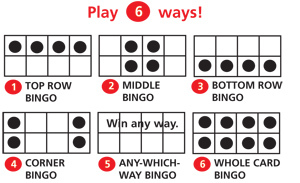 When someone covers all squares for the variation being played, he or she calls "BINGO", then says the covered words for the caller to check against those covered on the Calling Mat. If the answers match, you have a winner! Reshuffle the Calling Cards and start a new game. If the answers don't match, keep playing until someone has BINGO. TIP: Get to know common sight words. Practice finding the words in this set in articles, magazines, and newspapers.